Dental crowns are considered the building blocks of smile rehabilitation. They are used when teeth have become decayed, weakened, or cracked. 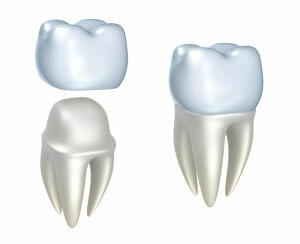 Dental crowns are also commonly known as “caps”, which slip over the surface of the tooth, covering it, and strengthening it. Tribeca typically uses porcelain dental crowns at our downtown New York office. However, other common crown materials are porcelain fused to metal or gold materials. Our porcelain crowns are color-matched to blend in with your surrounding teeth for a natural look and feel. To ensure that your crown has the perfect fit and placement, we use innovative computer programming to plan placement. After your crown is installed, you may experience some initial discomfort or sensitivity along with some heat or cold sensitivity. In this case, we will recommend some specially formulated toothpaste for sensitive teeth. This sensation will eventually go away. Over time, there is always the risk that your porcelain crown may chip, loosen, or fall off. If this occurs, your NYC dentist will help you solve the problem quickly. On average, a crown will last between five and 15 years. This depends on the amount of wear and tear the crown receives and how well your personal hygiene practices are. If you have a habit of grinding or clenching your teeth, chewing on ice, chewing your fingernails, or biting on other hard objects, or you tend to open packaging with your teeth, your dental crown may not last as long as it could. It’s best to treat your crown like you would your natural teeth. That is to say that you need to practice good oral hygiene such as brushing twice a day, flossing once a day, and using antibacterial mouth rinse.